W. W. Norton & Company, 9780393319804, 872pp. Hailed as "a remarkable achievement" (Boston Sunday Globe) and as "a triumph: simultaneously entertaining and instructive, witty and thought-provoking . 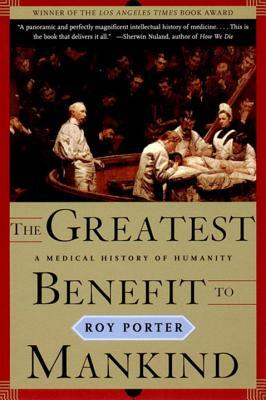 . . a splendid and thoroughly engrossing book" (Los Angeles Times), Roy Porter's charting of the history of medicine affords us an opportunity as never before to assess its culture and science and its costs and benefits to mankind. Porter explores medicine's evolution against the backdrop of the wider religious, scientific, philosophical, and political beliefs of the culture in which it develops, covering ground from the diseases of the hunter-gatherers to today's threat of AIDS and ebola, from the clearly defined conviction of the Hippocratic oath to the muddy ethical dilemmas of modern-day medicine. Offering up a treasure trove of historical surprises along the way, this book "has instantly become the standard single-volume work in its field" (The Lancet). "The author's perceptiveness is, as usual, scalpel-sharp; his manner genially bedside; his erudition invigorating." - Simon Schama.